This past July 8th Pope Francis carried out his first pastoral visit outside Rome on the island of Lampedusa, a small rock between Africa and Europe, a safe landing for tens of thousands of men, women and children seeking refuge from wars, persecution, misery, an intermediate stage of a journey that for too many (at least 20,000 over the past 25 years) ended in the Mediterranean Sea. ones - and in Europe - Munich and Madrid to name two examples - we remembered those who lost their lives in the journeys of hope to the North of the world. We commemorated “the many brothers and sisters who - as Pope Bergoglio said - were trying to come out of difficult situations to find a little serenity and peace, were seeking a better place for themselves and their families, but found death”. 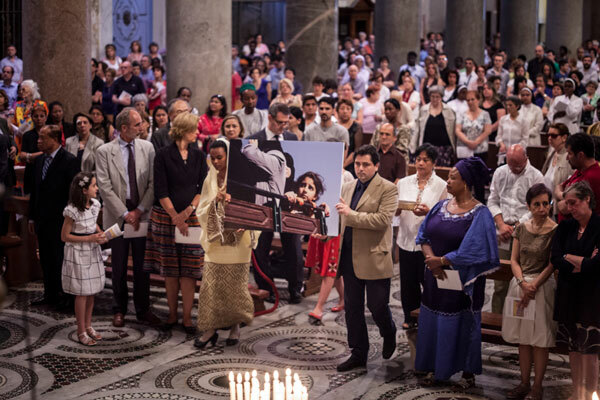 As was restated by Cardinal Vegliò, President of the Pontifical Council of the Pastoral Care of Migrants and Itinerant People, on June 20th, while presiding over one of the ceremonies organized by Sant’Egidio in the Basilica of Santa Maria in Trastevere in Rome, “welcoming the stranger is a divine commandment”. Faced with the globalization of indifference denounced by the Pope, each believer is bound by a commandment of participation, an attitude inspired at what Marco Impagliazzo, President of the Community, has called “the globalization of solidarity”. A solidarity that becomes emotional commemoration but also concrete assistance to support integration, as witnessed by the service for aliens and refugees organized by many communities of Sant’Egidio. Not only in Europe but also in other continents and in Africa itself, with support for the migrants who travel from Ethiopia and Somalia to South Africa. Faced with the large scale and sometimes tragic migrant phenomena of our time every Sant’Egidio community around the world wants to reject the “anesthesia of the heart” mentioned by Pope Francis and affirm with him : “It concerns us, it interests us, it is our business”.